Angel Falls, the Tallest Waterfall in the World - Do you include someone who loves adventure? What kind of adventure do you like best? And at any time do you do the adventure? Adventure into nature has become one of the many activities favored by the community, especially by young people. At this age, they will usually feel very challenged to perform a number of activities that test adrenaline. Some of the tourist destinations favored by travelers or challenges are like climbing a mountain, camping there for a few days, enjoying the beautiful scenery and cool weather, and in the evening making a campfire and sitting around the fire while singing and playing the guitar. Wow, fun is not it? Some of you may have experienced or experienced the atmosphere described above. Is not it? In addition to the mountain, other tourist attractions are often used as a destination for adventure by the traveler is Waterfall. The beauty offered by this waterfall is undeniable. Your eyes will not only be pampered with the water of the water that falls from the top of a very high cliff, but the scenery around the waterfall will also conjure up you with various amazing natural looks around. There are so many waterfall tours that you can visit the world, including in Indonesia. However, not everything you can accomplish easily and not everything will also provide a beautiful scenery for you. This is because some of them are in a state of less neglected. Well, if you want to know where the waterfall is very appropriate to serve as your next destination, Angel Falls is the most appropriate place. You will not be disappointed with the natural appearance you get there. Angel Falls is one of the most beautiful and amazing in the world. Angel Falls or Salto Angel is the world's tallest free-fall waterfall with a height of 979 meters (3,212 feet) with an unhindered fall of about 807 meters (2,647 feet). This waterfall is located in Rio Caroni, Canaima National Park, Venezuela. Although first seen in the early 20th century by explorer Ernesto de Santa Cruz, this waterfall is not known to the world until it was officially discovered by American aviator James Crawford Angel who was flying to find the location of a gold mine. In 1936, James Angel returned and landed his plane near the waterfall. This waterfall is called "Angel Falls" to commemorate its discoverer, James Crawford Angel. The Pemon Indians call this waterfall "Auyan-tepui" ("Aiyan-tepui") meaning "Satan Mountain". Its official altitude was determined by the National Geographic Society in 1949. The waterfall is one of Venezuela's most famous tourist attractions. Angel Falls is also known as Salto Angel. Before the mid-1950s, this fascinating Angel Waterfall was still an unknown wonder. Even an indigenous tribe named Kamarakotos Pomon which occupies the valley beside Auyan Tepu also away from the waterfall, because they believe that the remote location of the angel waterfall seems to contain or keep the spirit or something evil. In 1933, an American airplane piloted by a James Crawford Angel or often called Jimmie was found accidentally near the Angel waterfall. At that time, the purpose of Jimmie's arrival at the location of the waterfall was to look for precious rocks or golden seeds. In 1937, Jimmie returned to visit the waterfall along with his second wife and several acquaintances named Gustavo Henry and Miguel Delgado. They went there by boarding his plane. At that moment, Jimmie felt that he had successfully landed his plane on top of the Auyan Tepu mountain, but his guess turned out to be wrong, the plane wheels they climbed into the mud and consequently their plane was stranded or washed on the mountain until the year 1970. Well, if calculated, they've been plastered there for 33 years who guys. For a long time huh? For approximately 11 days, they had to walk through various rough terrain at the site, live on spare food, until they finally found a small settlement in Kamarata. News about the Jimmie exploits and the waterfall named after him eventually spread. This story ultimately attracted the attention of many people around the world and researchers to come to see and visit the waterfall. Canaima National Park, which is the location of Angel Falls was only recognized by the public in 1962 and recorded by UNESCO as a World Heritage Site in 1994. Upon entering the Canaima National Park, you will be breathed in amazement at the various tropical wildlife that will greet you at the Angel Falls gate. This UNESCO world heritage site can only be reached by using accessor air roads, as there are no overland routes to get to this park. Rutaca and Avior Airlines provide a flight service if you need it to get to the park. The flight base of Rutaca and Avior Airlines is at Camp. Canaima. The visitors will be taken through some of the waters in the jungle, which is still very natural and untouched by humans. Not only that, you will also see stunning mountain scenery and see many rivers that wriggle along the way. To be sure, you will get an unforgettable experience while in this place. Before flying, the visitors must first be given a vaccine to fight or prevent the occurrence of yellow fever. Visitors to this park will also usually be flown from the Colonial city of Ciudad Bolivar or the Venezuelan capital of Caracas. (This alternative seems to be much cheaper, compared to renting the aircraft itself). Upon arrival at Canaima, you will be charged for $ 4. Arriving there, your eyes will be spoiled with a very beautiful appearance, which is as far as 50 kilometers from the waterfall angel. You will see the scenery of Canaima that is framed or surrounded by some low-altitude waterfalls, which fall and flow into a lagoon and end up onto a very beautiful sandy beach. It's amazing, is not it? Eits, that's still nothing guys. There will be something far more amazing than that. A visit to the angel waterfall is still continuing from the camp. From there, the journey will be more exciting again because you will not only use the land route, but also the sea route. This is because the next field must be passed cannot be reached by using the land vehicle. Although the campsite provides terrestrial accommodation like a jeep, it can only be used for short routes. To get to the waterfall, you have to drive a boat. In addition to the ship, visitors can also use the plane with Canaima flight to Lagun Canaima. You can also travel on motorized boats that are usually provided at certain times such as in January and May. The journey you have to do to get to this angel waterfall is very varied. The average journey takes 5 hours to reach the waterfall from the camp. During the trip, you will see the winding waters with views of dense forest populated by various types of wild animals, see the water that is skating on the rocks through the rushing and fast-flowing part of the river. From the lagoon, the visitors will walk through the lush Venezuelan forest. And if the flow of the falling waterfall at that moment is not so swift or flowing gently enough, the tourists are allowed or even encouraged to swim in the pond formed from the falling water. The journey to the angel waterfall can be booked in advance through various travel operators. The garden lodges also run a scheduled trip that can be booked when you arrive at the Canaima camp. The size of the Canaima national park is estimated to be about the size of Belgium. Therefore, there should be many things that can be done there. This park is home to 550 species of birds, 500 species of ocelot orchids, pumas and many others. During your stay there, you have the opportunity to plunge into nature and sunbathe on the wide edge of the lagoon. Visitors are also encouraged to take part in various activities there, such as climbing, traveling down the river by boat, making visits to villages close to the location and so on. Roraima, which is one of the tops of mountains near the Guyana park or border of Brazil, is the tallest and most impressive mountain Tepui that resides in the park. This mountain has a height of 2810 meters at its highest point and remains a favorite of people who thirst for beautiful scenery. The trip to the top of this mountain will take a long time, which is five days. Although fairly long, when it arrives there, you will not be disappointed. There is also a well-known footpath, the sapo (frog) and sapito (small frog) offering visitors the opportunity to walk behind the flowing water curtain, where the kevac gorge and its dramatic waterfall La Cueva northwest of Kamarata - an old village called pomon. A group of indigenous settlements consisting of several straw huts is also located in this region. Here you will also find a small shop, guest accommodation, and a small airfield. When is the right time to visit Angel Falls? Angel waterfall would be better if visited in May and November. Usually, between December and April, rainfall in the region is much more frequent. There is a variety of accommodation available to visitors in this place. One of them is jeep accommodation that can be used if you want to travel with a short route from the camp kanago. One thing to keep in mind is camping is prohibited in this Canaima National Park. Angel Falls waterfall three times higher than the Eiffel Tower in Paris. 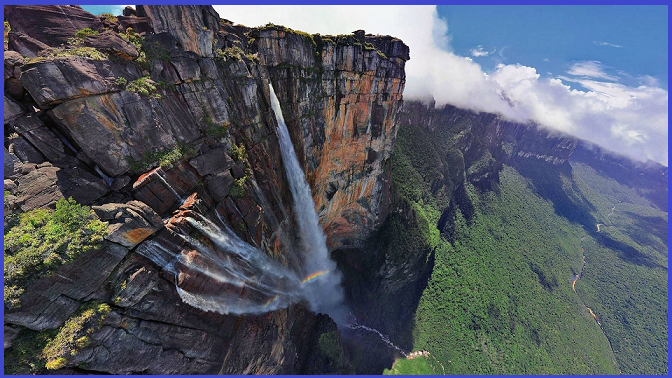 Angel Falls is the highest waterfall in the world. In Spanish, this waterfall has the name salto angel that falls from a height of 3230. During the rainy season, Angel Falls will create its own weather. At certain times, those within a radius of one kilometer from this waterfall can feel the fog that is attached to their skin. Canaima National Park is divided into two parts, namely west and east. This angel waterfall is located in the west. Tourists are only allowed to visit the angel falls since 1990. The first visitors to this waterfall live in the Boulton camp, now known as Campamento Canaima. Jimmie Angel aircraft can be seen in the Maracay aeronautics museum. That's about the amazing Angel Falls information in Venezuela. For those of you travelers and lovers of extreme activities, hopefully, this information can be useful for you. Have a good vacation and enjoy your journey and adventure.